How much money does Pastor Peter Lumpkins’ church give to Lottie Moon? In his December 13, 2011 post entitled, The International Mission Board and Uninspired Missions Giving, Peter “Plumpkins” Lumpkins rails against the establishment again. This time his speculative interests are aroused due to the selections of J.D. Greear and David Platt as being spokesmen for the Lottie Moon Christmas Offering for International Missions. Because the kind of evidence Plumpkins desired was not readily at hand (read: he was too biased to be thorough) he relied on partial evidence. Very quickly Jared Moore “called out” Plumpkins and the blind he leads at his blog. Moore’s post of December 13, 2011 revealed Plumpkins poor research and erroneous conclusions. Plumpkins responded in form: deny, deny, deny, distract, distract, distract. Oh, and there was also an appearance by Pastor Tim “Roger Dodger” Rogers who commented ineffectually as is his custom. According to the church’s website, Greear’s church sponsors a yearly “Christmas Missions Offering,” the goal of which is 625K for 2011. A full 75% ($468,750) will go toward “Church Planting” and the remaining 25% ($156,250) will be used for “Local Outreach.” One will look in vain for any specific reference that monies raised will be given to The Lottie Moon Christmas Offering. But if Greear’s church does not participate in cooperative giving toward raising the $175,000,000 the International Mission Board of the Southern Baptist Convention is pursuing, why is J.D. Greear a spokesman for the offering? Why would IMB allow him to be a catylst for inspiring others to give to a cause toward which Greear apparently has no loyalties? Emphasis added. 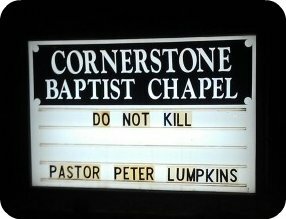 You see how Pastor Peter Lumpkins plays the game? He places his presumed blame for the church’s actions under a previous pastor in the lap of the current pastor. One could only hope that Plumpkins church, Corner Stone (Cornerstone) Baptist Chapel of Waco, GA gives him a little more grace. Before or after Deacons' meeting? And speaking of Pastor Peter Lumpkins and Cornerstone Baptist Chapel of Waco, GA: what about their Lottie Moon giving? What pattern does this critic show for good Southern Baptists to follow? Not a very good one it seems. Nor is it reasonable to assert the “did-you-call-before-you-made-that-statement” nonsense. That’s why we have data banks, Jared. And, I employed the data bank in no special or biased way toward either Greear or Platt. Emphasis in original comment. What, then, does the “data bank” show? Not bad for a church with 45 attendees. Your eyes do not deceive you. Year over year, the church pastored by uber-gripe, Pastor Peter Lumpkins of Cornerstone Baptist Chapel, dropped their Lottie Moon Christmas Offering giving to zero, zilch, zip, nada. Not. A. Single. Red. Cent. Plumpkins tried his best to make this a “poster boy” or “spokesman” issue, but in his above comment Plumpkins derided Greear for “[apparently] having no loyalties” to the Lottie Moon offering. Loyalty to the LMCO? Really, Peter? **The research methods employed for this article were the same as those employed by Plumpkins. Therefore, it matters not when he became the pastor. He is still to blame.